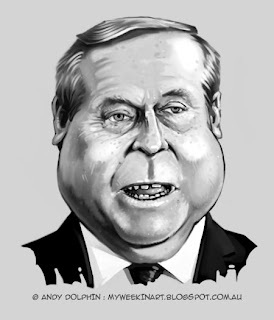 My Week in Art: Colin Barnett - AAA-rated caricature? Colin Barnett - AAA-rated caricature? With the news today the Western Australian state budget has been so badly managed that our AAA credit rating has been downgraded, I thought I should repost a caricature I drew a few weeks ago. Colin's a popular boy today. Scathing attack on my artwork!